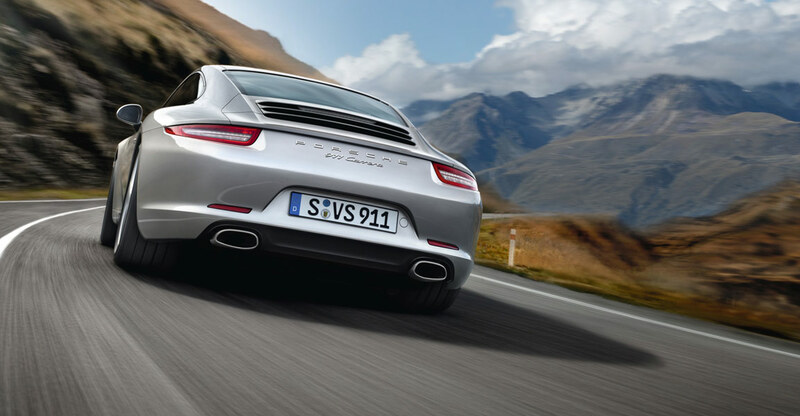 NEWS: Porsche hours cut – Snapshot Azerbaijan – Istanbul third bridge concerns – Russia, Day of Roads. Channel delays: Tech hitch means P&O Calais-Dover 17:55 and Dover-Calais 19:15 this evening, and Calais to Dover 08:40 & Dover to Calais 10:15 tomorrow are all cancelled. Also, high winds mean 30min delay on some P&O Dover Strait services. Plus, rough seas head for next 24/36 hours says Condor Ferries. Weather alerts: Amber alert for storms northern Italy and Czech Republic. Also storm and high winds warnings Belgium, Netherlands and southern Germany. Weather: Settled and dry – even warm – in the South; windy and rainy in the North. TURKEY. An aerial expose of the environmental impact of Istanbul’s under-construction Third Bridge over the Bosphorus in today’s Sunday Zaman. The bridge, and connecting road – over the northern part of the Bosphorus Strait, Istanbul city is in the south (click for a map) – runs through dense forest on both sides. As we’ve seen – from the Gezi Park protests in the summer and the on-going controversy over a new road through Ankara’s ODTU University campus – the consequences of new development is currently a highly sensitive topic in Turkey. The new bridge – called Yavuz Sultan Selim – should open in 2015, at around the same time as a new road tunnel south of the city. Concerns are as much about what new development will be allowed/stimulated around the new infrastructure as much as the immediate damage caused by building. RUSSIA. It’s the Day of Roads today, the official holiday for road workers. In a congratulatory telegram, President Putin says, ‘Your work is honourable and responsible… I believe you can be proud of the results achieved.’ It’s been a busy few years what with new highways around Sochi for the 2014 Winter Olympics, advancing construction on the M11 Moscow-St Petersburg superhighway and much of the Western High Speed Diameter Road (WHSD, above) across St Petersburg recently opened. 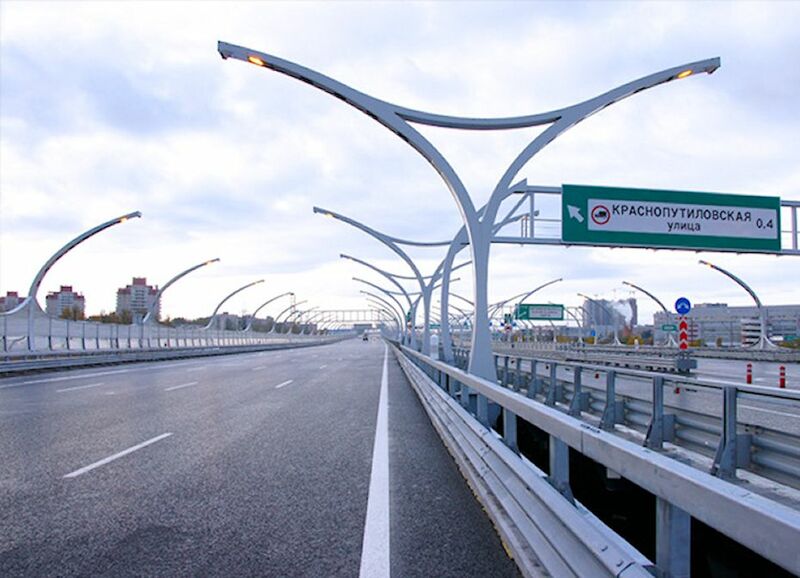 Next on the list is a massive new ring road around Moscow. Another picture filched from www.azeryol.az the Azerbaijan state road building company. 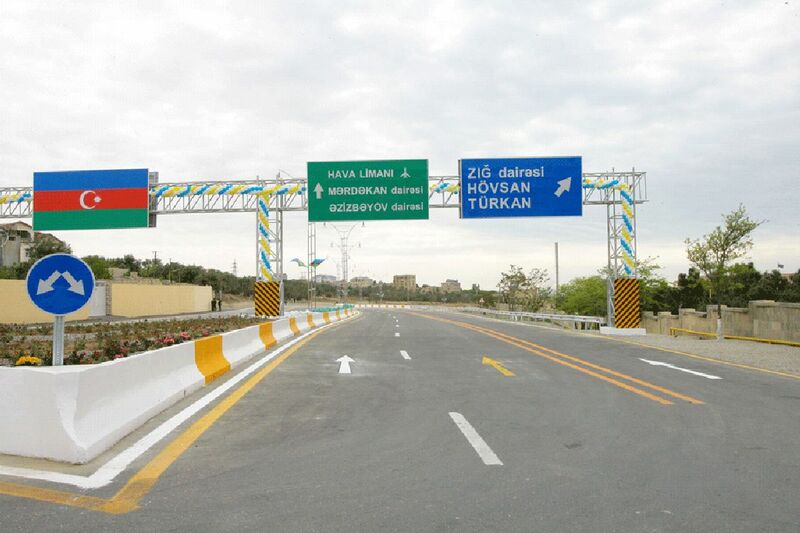 There’s no supporting information, but from the signs – Turkan and Hovsan are both towns on the Absheron Peninsula on the shore of the Caspian Sea – this looks like a road heading out of Baku, the capital. Dairəsi BTW means roundabout. Did you know that, at 28m below sea level, Baku is the world’s lowest lying city? Meanwhile, the Azerbaijan parliament has ratified a deal to replace the ageing bridge over the River Samur – between Samur and Yarag-Kazmalar (RF) – in the north of the country. Famously congested, the new bridge will cut transit times considerably. The deal was first agreed back in August on a visit by Vladimir Putin. No word on time frames yet.